The Crail Golfing Society may be over 200 years old but they do know how to move with the times. Due to the pressure of an increasing number of visiting golfers, a decision was made in the mid 1990s to acquire a relatively modest 114 acres of land next to their Balcomie course and transform the cliff top setting into a modern, seaside golf course. Hanse may have been a surprise overseas selection as architect but he was no stranger to UK shores as he had spent a year during his Cornell studies with the famous English golf course design firm of Hawtree so he was well aware of what would be expected of his inaugural design in Britain. His interpretation of a Scottish links is very good, despite the fact that the terrain is more pasture and headland than true sandy soiled links land. An interesting challenge for Hanse was to incorporate several stonewalls – and one of particular archaeological importance, “Danes Dyke” – into the design. This elevated track cuts across five holes, presenting a formidable barrier from the tee on the uphill 11th hole and creating a blind approach to the green at the 15th hole. It’s obvious that some earth moving was carried out on the property – particularly, for example, at the 2nd where an almost island green has been created at a 45-degree angle to the fairway – but the finished holes never appear out of sync with their surroundings. The most striking design elements at the Craighead are the bunkering and green complexes. The bunkers were created under the watchful eye of Walter Woods, a former green keeper on the Old Course at nearby St Andrews. So it should come as no surprise that some have likened them in quality to those at Muirfield. Putting surfaces were constructed to USGA standard, running very true and fast, with many contoured greens providing a real test for putting skills. It’s a mystery as to why the Craighead did not feature in any golf course ranking tables since it came into play in 1999 until we first ranked it in 2008 – are golfers so enthralled with playing at the traditional links along the Fife coast that they are overlooking a genuine, modern day golfing gem that is staring them in the face? I played Craighead for the first time on New Year’s Day - actually putting out on the first as the sun came up over the North Sea. There’s no shortage of great courses in the area but it’s well worth finding time to fit in a round here; Gil Hanse has done a great job creating a fun and challenging course to complement the old Balcomie links. As others have written, the back nine is definitely the highlight, making full use of the more interesting ground closer to the sea; the short par 4 10th and the longer 14th, running along the cliff edge, stood out for me, but the truth is that there isn’t really a week hole on the course. Even on the front nine, much of which is over the less promising ground, strong bunkering and interesting greens make for a good test. I finally got round to visiting Crail last month, playing the more exposed Craighead in the morning and the Balcomie in the afternoon. Gil Hanse has created a modern design that beautifully compliments it's historical older sibling next door and although Craighead is considerably longer and tougher, there is more than enough width to the fairways to make it very playable for everyone. After a gentle par-5 opener, the excellent dogleg 2nd requires some thought and is possibly the best hole on the front 9. Although not particularly long, accuracy from the tee is crucial if the best line of approach is to be found to a raised and heavily defended green. The not-so short 5th, a par-3 measuring 211 yards from the yellow tees, is a rather bland hole in all honesty and my least favourite on the course but the other par-3's are all stand-out holes. The 7th and 13th are well defended, attractive cliff-top holes and the 17th contains the most wickedly undulating green of them all. The pace picks up considerably on the back nine, kicking off with a brilliant drive-able downhill par-4, with anything played too far right running the risk of being gobbled up by a large gorse bushes. From here onwards much of the course is bordered or crossed by attractive stone walls which certainly add to the challenge and aesthetic charm. The downhill 12th offers another opportunity to drive the green for the better players and the 14th,16th and 18th are all solid par-4's late in the round. During our second golf trip to Scotland, we visited Fife. After we met the ultra nice head pro Graeme Lennie and his assistant David, we decided to play both Crail courses that day: Crailhead in the morning and Balcomie in the afternoon. It was a bit of a grey start of a busy day at Crail, but the pace in the morning was still OK-ish. Crailhead offers a very decent opening nine, good turf and greens, but I was not overwhelmed by the plot of land the holes have been laid out: it did not give me the feeling I was playing a links course. Luckily the second nine has links character by the dozen, starting with a charming short par4 and ending the round with a testing, long par4. We found the course in excellent condition, despite the fact that Fife had been extremely dry the weeks before and during our visit. The clubhouse offered a welcomed lunch & tea and promising views of the course we would play in the afternoon, Balcomie. If you decide to travel up to Crail to shoot some golf, I can recommend to play the Crail combo in this order: it will give you a decent golf warm-up in the morning and a links adventure in the afternoon. You will not be disappointed. 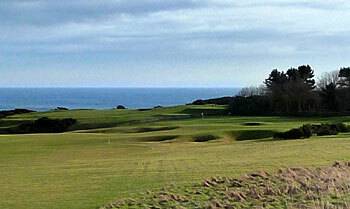 Situated above the old Balcomie links, Craighead is even more exposed to the wind than its neighbour. The greens are excellent and the fairways are hard and very linksy. The bunkering is well placed but is not overdone. Most of the greens on the Craighead, in complete contrast to the Balcomie Links, are very undulating. On the back nine some are also raised with mounds toward the centre. This makes it difficult to get close to the flag, even more so in the wind. A deliberate design feature at Craighead is that there are no two consecutive holes running in the same direction. This will keep you constantly guessing if, as I did, you play in what our member friend said was a “7 out of 10 wind”. There are some tough par fours here with three of them being in excess of 450 yards. The par threes were a real feature with the 13th and 17th being outstanding. The 160-yard 13th plays to a green with a gully and then then a steep cliff very close to the left edge. The 197-yard 17th features the best bunkering on the links. Golf World Magazine brags about having the best panel available and producing authoritative and definitive ranking lists. I thought it was a simple mistake when they omitted the Craighead from their inaugural Scottish Top 100 in 2011 but when they missed ranking this course again in 2013 I wrote to the their editor suggesting he gets better informed. It is great to see the Craighead ranked on this website and I know it has been in the Scottish Top 100 since the first list was published back in 2007 I think, but come on guys 91 is way too low. With courses like Belleisle, Bruntsfield and Royal Musselburgh ahead of it in the rankings, it makes me wonder whether I played the real Craighead or some fantasy course earlier this year. OK let me make a bold statement, I think the Craighead is better than the Balcomie… now then, what do you say about that? BTW I am not a member of the Golfing Society nor am I Gil Hanse’s boyfriend! Played for first time today. Very nice, fairways in excellent condition; can't comment on greens as just been hollow cored. Lovely course, not as spectacular as the Balcomie. Really must play this course. A modern and welcome addition to the Crail golfing society that has more length than the old Balcomie links. When played in a good stiff breeze it certainly gave me enough of a challenge. The conditioning is good overall but the course does still look a little immature in places. The design makes the course play longer than its 6,221 yards (yellow tees) with bunkers protecting the corners of doglegs and raised green such as the par 5 15th making accurate approaches more relevant than imprudent swipes. The stone wall improves the aesthetics and I found particularly confounding on the 11th. The par threes are also of high quality. The views especially from the clifftop holes are fabulous. A very enjoyable round of golf and a completely different experience than the Balcomie. Whatever you do, do not think of it as the lesser or second course. It is a really good track and fun to play. Makes for a great day of 36 holes at Crail...and a nice club to boot! Nearly three years after last playing the Craighead course, I returned for a wee “winter warmer,” more than glad to reacquaint myself with one of the most under rated modern Scottish courses. Again, I loved the bunker complexes, particularly on the kink of dog legs, and the fast, firm, smallish greens were an absolute pleasure to putt on. The back nine is definitely the better of the two returning loops but hole 2 just might be the best on the card, a cracking short par four with a wickedly positioned green. The clubhouse has been given a complete makeover and looks more than capable of serving the 7th oldest golfing society in the world well into its third century. Ties (stamped 1786) are available behind the new bar for a tenner and one was duly snapped up by yours truly – how many of the other antiquary clubs would allow non-members to swank around with an 18th century-hallmarked necktie?